Our closest branch is right in your pocket. Mobile Banking from Independent Bank is secure, free, and simple, and we ensure complete privacy and protection of your account information and transactions. To get started, you must be an Independent Bank customer with Online Banking. Sign into your account and choose the “Get Started” option from the Mobile Banking Center, or simply download our Independent Mobile app and follow the instructions. Message and data rates may apply. Have an iPhone and want to make your monetary transactions even faster? Customers have the option to select a four-digit passcode to sign in to Online Banking, as opposed to the User ID and password. The passcode must be four numeric characters, 0-9, with no ascending/descending sequential digits, or four repeating digits. With a supported iPhone or iPad, you can also sign in with Touch ID! You may choose to use either the Touch ID or passcode option, but can't have both active at the same time. For any questions, please call Customer Service at 800.355.0641. Simply select a link below to find answers to common questions about mobile banking or text banking. If you have additional questions, please call customer service at 800.355.0641, available Monday-Friday from 8 am-8 pm and Saturday-Sunday from 8 am-6 pm (ET) or our 24-hour toll-free telephone banking number 888.300.3193. *Please Note: All users with registered Touch ID fingerprints on your device will have access to account balances, account information, and have the ability to perform monetary transactions. Mobile Wallet is an electronic version of carrying your credit and debit card information on your mobile device. Instead of using your physical card to make purchases, you can pay with your smartphone, tablet, or smartwatch. Use your mobile wallet to make purchases at retail store locations by holding your mobile device up to the card reader. It also allows you to make quick in-app purchases without having to enter your card information. As a valued credit card member of Independent Bank, you can use Apple Pay®, Samsung Pay, and Android Pay. As a valued debit or credit card holder of Independent Bank, you can now use Apple Pay! 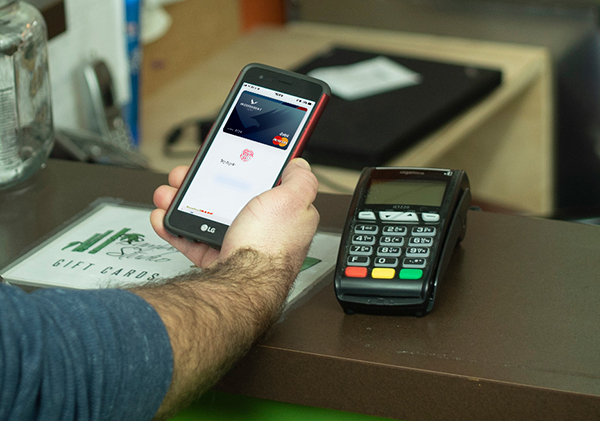 With a single tap it's possible to make secure, mobile payments at over 220,000 locations. Apple Pay is a mobile payments technology that allows you to make a purchase with an iPhone® 6, iPhone 6 Plus, or even a new iPad® using your debit or credit card. Plus, you're able to authenticate purchases with a thumbprint. It's easy to use Apple Pay. First, make sure you have the latest version of iOS 8. No other apps are needed. Then, add your credit card to Passbook® by taking its picture and following directions on your iPhone. Once your debit or credit card is verified, you're ready to shop. Visit http://apple.com/apple-pay for more information. Samsung Pay is a mobile payment technology that allows you to use your Independent Bank debit or credit card for a simple and secure way to pay with your Samsung device. Use Samsung Pay at your favorite place—almost anywhere you can swipe or tap your card. Transactions are authorized with your fingerprint, and a random token is used instead of your actual card details to keep your information safe. Securely load your cards for easy purchases. Google Pay is the fast, simple way to pay online, in apps, and in stores using your Independent Bank debit card saved to your Google Account. With multiple layers of security, it protects your payment info. Use Google pay to check out in hundreds of apps without entering payment information. Look for the Google Pay icon online and spend less time checking out when you pay with Google Pay. We offer competitive rates for checking accounts, savings accounts, certificates of deposit (CDs), and mortgages. 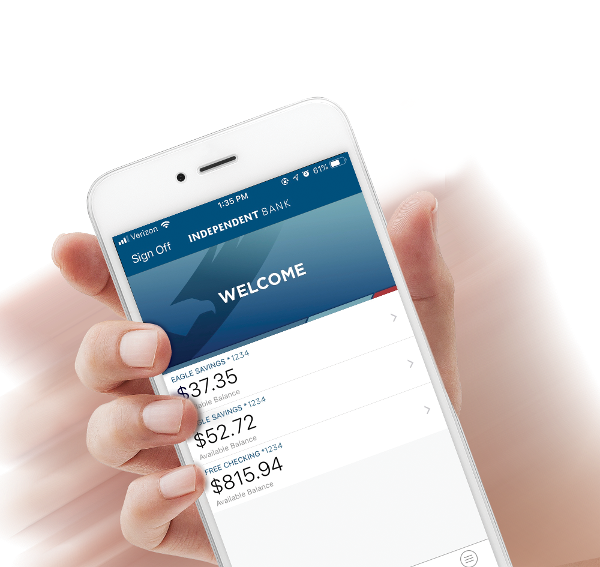 Our Mobile Banking app, Independent Mobile, gives you access to your accounts from your smartphone or tablet. You can view account balances, pay bills to existing payees, search recent account activity, transfer funds, use SnapCheck mobile deposit, and find ATM or branch locations. Yes, Independent Bank supports the most current security to ensure complete privacy and protection of your account information and transactions. In addition, no account data is ever stored on your phone. In the event your phone is lost or stolen, the service can be immediately disabled by logging into Online Banking and clicking the “Manage Mobile Banking Settings” option. How do I sign up for Independent Mobile? Download our Independent Mobile app and follow the instructions, or sign into Online Banking on your computer and choose the “Get Started” option from the Mobile Banking Center. Is Independent Mobile supported on my phone or tablet? The app is supported on Apple and Android smartphones and on Apple iPad devices. How do I install the Independent Mobile app? 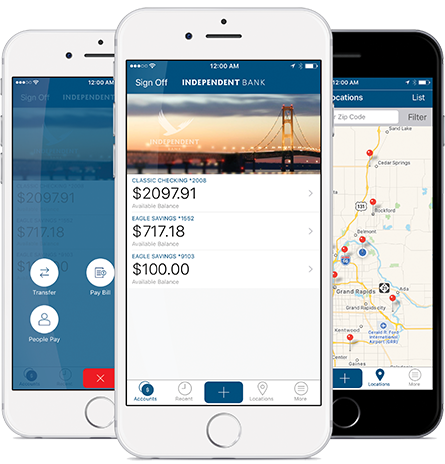 Simply go to the Apple or Google Play store, search “Independent Bank,” and download the Independent Mobile app. Text banking gives you access to your accounts via text messages. It's a fast, easy way to look up account balances or recent account history by sending a text command to a short code. What is the Independent Bank short code? All text messages should be sent to 79680. You will only receive messages when you specifically request them with one of the text banking commands. Typically you should receive a text message within a few minutes after enrolling. However, sometimes mobile carriers experience delays that slow down text message delivery. While waiting, make sure your phone has a wireless signal. In addition, be sure you entered the correct phone number on the enrollment site. Activation codes expire after a specific period of time (usually 24 hours). If you need a new one, return to the Mobile Banking enrollment site (accessed by clicking “Manage Mobile Banking Settings” through Online Banking) and request a new activation code, or, if you are enrolled in text banking, text the command “R” to 79680. If you get a new phone or change phone numbers, be sure to return to Online Banking and update your phone number in the Mobile Banking Center. We recommend removing your old phone and re-enrolling your new phone. Yes, please access the Mobile Banking Center through Online Banking to activate another phone number. In the event your phone is lost or stolen, the service can be immediately disabled by logging into Online Banking and clicking the "Manage Mobile Banking Settings” option. If you are concerned about misuse of your phone, contact your mobile service provider immediately to stop all wireless services.